Jadon Sancho has yet to make a first-team appearance with Borussia Dortmund, but was a revelation with England at the World Cup in India. Jadon Sancho has flown from India to Cyprus in order to be available for Borussia Dortmund in the UEFA Champions League this week, after the Bundesliga leaders exercised their option for him to return from the FIFA Under-17 World Cup following the group stage. 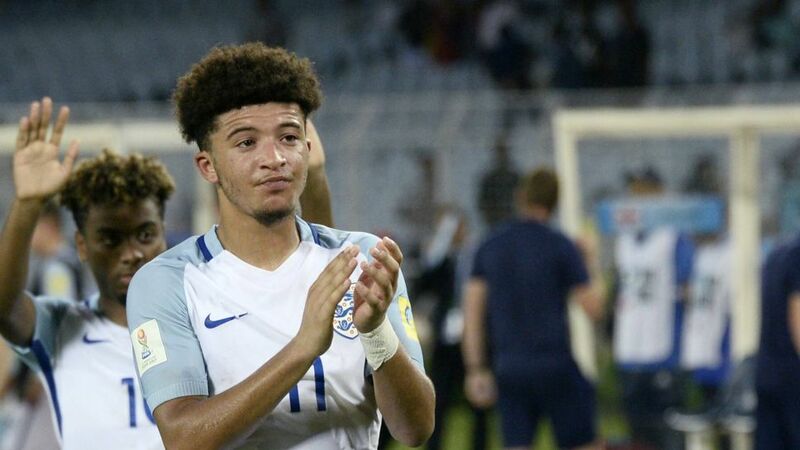 Sancho, 17, started all of England's fixtures in India, scoring three goals to help them qualify for the last 16, where they will face Japan. Dortmund initially released their summer signing only for the group stage, however, they have now summoned him back, albeit to Cyprus rather than Westphalia, since they are gearing up to face APOEL Nicosia on Tuesday night. Dortmund coach Peter Bosz has named a 22-man squad for the trip, including Marcel Schmelzer, who has missed the past five weeks due to an ankle injury. Sancho will now be hopeful of being one of the 18 names on Bosz's team sheet having shone in India. "People enjoyed seeing him play," commented England's under-17s coach Steve Cooper on TheFA.com. "It’s sad to see him go." Sancho left the England camp in Kolkata on Sunday evening, while Dortmund jetted out to Nicosia on Monday morning, ahead of a game they desperately need to win to get their Champions League campaign up and running after back-to-back defeats to Tottenham Hotspur and Real Madrid.